Next-generation technology enters the cockpits at Lufthansa Cargo. Lufthansa’s cargo airline has developed the 500-gram iPad into a new “Electronic Flight Bag” (EFB). In the future, the EFB, with navigation maps, operating manuals and other important documents will be just a finger-swipe away. 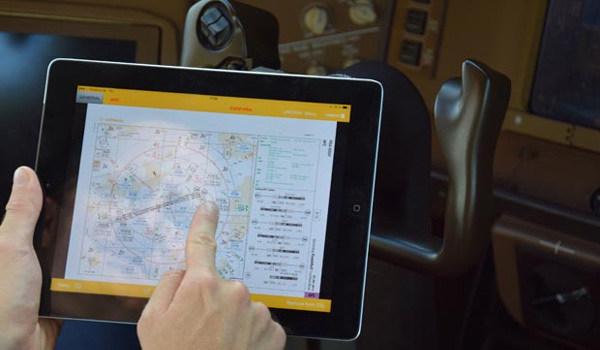 “The iPad is the ideal basis for modern communication with the pilots and digital processes in the cockpit,” commented Wolfgang Raebiger, Director of Flight Operations at Lufthansa Cargo. The environment also benefits: The removal of docking stations for the current laptop EFB and thick cabling reduces weight, which means less kerosene will be used per flight. “Safety first” of course remains the highest priority with the introduction of the new EFBs. “Already today we can guarantee that the iPad will provide the same functionalities as our current generation of Laptop EFBs. By that we lay the foundation for the integration of future technologies,” stated Raebiger. The latest iPad generation will be rolled out at the end of the year and Lufthansa Cargo’s aircraft will be retrofitted starting from the new year, depending on delivery times and service layovers.